Increasing atmospheric concentrations of three major greenhouse gases (GHG) are the main drivers of climate change. Efforts to ameliorate rising levels of GHG include the protection and restoration of ecosystems that constitute major carbon (C) sinks and minor sources of CH4 and N2O emissions. 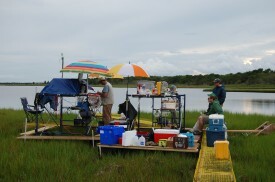 Tidal marshes are prime candidates for such efforts as their sediments display high C sequestration. Loss of wetlands through human impacts such as land conversion, sediment supply disruption, nutrient loading, and with sea level rise, reduces future sequestration capacity and places at risk stores of C that built up over past centuries. Improved management of coastal C and nitrogen (N), based upon sound science, is a critical first step towards mitigation of climate change and management of coastal ecosystems. Management must address N loading that has the dual impact of 1) contributing to climate change through production of N2O, and 2) reducing production of root and soil matter by plants which can decrease the C sequestration capacity and resilience of marshes to sea level rise. Recognition of the importance of coastal marine systems in terms of C storage has led to national and international efforts to place monetary value on preserving or restoring the “blue carbon” in those systems, analogous to the value placed on forests. The barrier to incorporation of tidal wetlands into C markets is the absence of agreed upon GHG offset protocols that set guidelines for monitoring and verification requirements for wetlands projects, and a lack of data and knowledge regarding C and GHG fluxes in wetlands to support model development. The project goals are to provide scientific information that can inform both C and N management as well as wetlands protection and restoration strategies for supporting development of policy frameworks and market-based mechanisms to reduce GHG.